Oil Painting Reproduction of Leighton- God Speed! 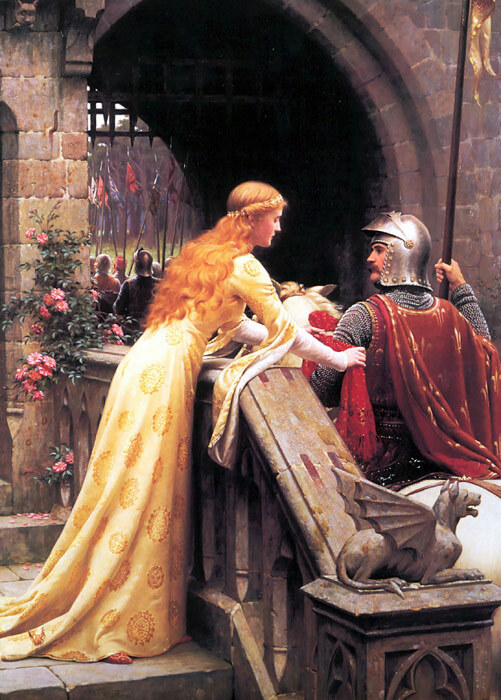 Edmund Blair Leighton was a painter of historical genre paintings, mainly of medieval times - God Speed!, The Accolade, Alain Chartier, Call to Arms, but also regency - The King and the Beggar -Maid, A Favour, Courtship. Blair Leighton is now one of the most popular of the painters on this web site, his oil paintings being amongst the most frequently reproduced . Rather like Waterhouse, and Herbert Draper, Leighton the man has virtually disappeared. The reasons for the continuing popularity of the Blair Leighton paintings are not difficult to understand, as they are similar to those in his lifetime, namely nostalgia for an elegant chivalrous past. Leighton was also a fastidious craftsman, producing highly- finished, beautifully painted, decorative oil paintings. It would appear that he left no diaries, and we have been unable to locate any mention of him in biographies, and though Blair Leighton exhibited at the Royal Academy for over forty years, he was never an Academician or an Associate. We set out below such information as we have been able to accumulate on the elusive Leighton.